National Chocolate Pecan Pie Day. And, if that isn’t good enough, Wednesday, August 21 is National Pecan Torte Day. Delightful Pastries is celebrating at all three of its locations (Chicago French Market, N. Wells St., and Jefferson Park) by offering their delicious Chocolate Pecan Bourbon Pie ($5.25/mini pie; $25/8-inch pie) by executive pastry chef and owner Dobra Bielinski (recipe below). Delightful Pastry also has the Chocolate Pecan Pie available without Bourbon. Here’s a tidbit that will pique your interest. Did you know that pecans contain zinc, which boosts testosterone? Zinc is the reason people think oysters are aphrodisiacs. We bet you're in the mood for a slice now! Not just for Thanksgiving, pecan pie is a Southern staple and for good reason. There’s nothing quite like the smell of its warm, buttery crust and gooey, nutty center coming out of the oven. The origin of the pecan pie is a little flaky. Claims have been made of the dish existing in the early 1800s in Louisiana, but this does not appear to be backed up by recipes or literature. Attempts to trace the dish's origin have not found any recipes dated earlier than 1897, and well-known cookbooks such as Fannie Farmer and The Joy of Cooking did not include this dessert before 1940. 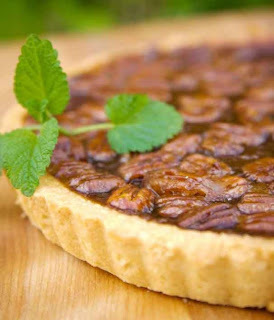 Some have stated that the French invented pecan pie soon after settling in New Orleans, after being introduced to the pecan nut by Native Americans. Pecan pie may be a variant of chess pie, which is made with a similar butter-sugar-egg custard. Whatever the history, it holds a well-deserved spot on your dinner menu. Most pecan pie recipes call for a mix of eggs, butter, sugar, vanilla, salt and syrup or molasses poured into a pastry shell. Adding melting chocolate or bourbon are popular variations of the classic. Regardless, a scoop of fresh vanilla ice cream is always a welcome addition. Delightful Pastries’ gives it a welcoming twist, adding bittersweet chocolate and bourbon to make a perfect pie for any occasion. Founded in 1989, the Delightful Pastries is family-owned and operated, and is one of Chicago’s most beloved bakeries. The partnership includes mother Stasia Hawryszczuk, who manages the original Jefferson Park location with her daughter Dobra Hawryszczuk Bielinski. Dobra also oversees the Old Town location, and her brother Robert Hawryszczuk, along with his wife, Nico Hua, operates the Chicago French Market location. From its roots as the baker of authentic homemade Polish specialties prepared according to European baking traditions that have been handed down from generation to generation, Delightful Pastries has expanded its delicious offering of fresh products to include a wide range of breads, brownies and bars, pastries, croissants, cakes, tortes, pies, macaroons, cookies and savory items such as soups, sandwiches, salads and quiches. Delightful Pastries has been featured in numerous local and national publications including the Chicago Tribune, Chicago Sun-Times, all local television news outlets and even the Tonight Show. The original Delightful Pastries location is at 5927 W. Lawrence Avenue, Chicago, in the Jefferson Park neighborhood (phone: 773-545-7215). Store hours are Tuesday-Friday from 6:30 a.m. to 6 p.m., Saturday from 6:30 a.m. to 5 p.m. and Sunday from 8 a.m. to 1 p.m.; closed on Monday. The Old Town Chicago location, which includes the Café, is at 1710 N. Wells St., just north of North Avenue (phone: 312-255-0724). Store hours are Monday-Saturday from 8 a.m. to 6 p.m. and Sunday from 9 a.m. to 5 p.m. The Chicago French Market location is at 131 N. Clinton Ave., Chicago (phone: 312-234-9644). Store hours are Monday-Friday from 7 a.m. to 7 p.m. and Saturday from 9 a.m. to 5 p.m.; closed on Sundays. For more information about Delightful Pastries, including catering, delivery, and wholesale services, please send an email to info@delightfulpastries.com or visit the website at www.delightfulpastries.com. In an electric mixer, beat the butter with the sugar till smooth. Add the corn syrup and molasses, then the flour and mix well. Beat in the eggs one by one, scraping down after each egg; add the vanilla extract and salt. Fold the pecans and chocolate by hand, add the bourbon. Bake for 45 to 60 minutes, till the top is dry and the filling is barely jiggling. Let cool. 8 servings.